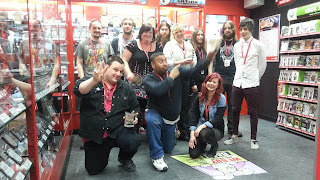 blog.webuy.com: CeX Wexford is open! What a day! We've just finished opening CeX Bangor in the North, and now Wexford is open too. Yes, the second CeX store in the Republic of Ireland is now open at 3 North Main Street for your buying, selling and exchanging pleasure. Pop in and see why we're so excited. Better still bring in your old games, phones, movies and gadgets and sell them for a fist full of Euros. Wet CeX in Wexford, now open! Just some of the Global team that made CeX Wexford.